Filmography for "Fists of Fury"
Story: Bruce Lee unleashes his Fists of Fury in this violent action packed tale about a young man who made a promise not to fight in his new home. He begins working at an ice factory. After a few of his friends vanish  without a trace, he begins looking for them. What he finds and what would happen next throws Bruce into a fight for revenge and his life! I give the movie 3 stars. It is the first movie of bruce's adult career. It has a good story line and a good ending to it. It's the cheesiest movie of of his adult career I think. Still a serious movie but a bit cheesy. Giving the time it came out though, and the other martial arts movies at the time, hell, it deserved an oscar! Even today matched against now a day Martial Arts movies, it holds it's own, with plot, and even better yet, fight scenes! Highlights: Some AMAZING FIGHT SCENES! 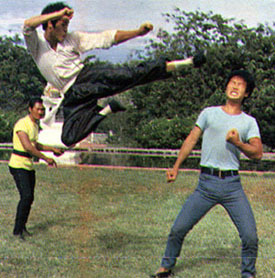 I mean after all this is a Bruce Lee movie! A good twist on the ending I thought. A fight scene where bruce takes on about 20 guys at an ice factory! And not too mention a hell of a fight at the end of the movie! Of course if you haven't seen this movie, what are you WAITING FOR?